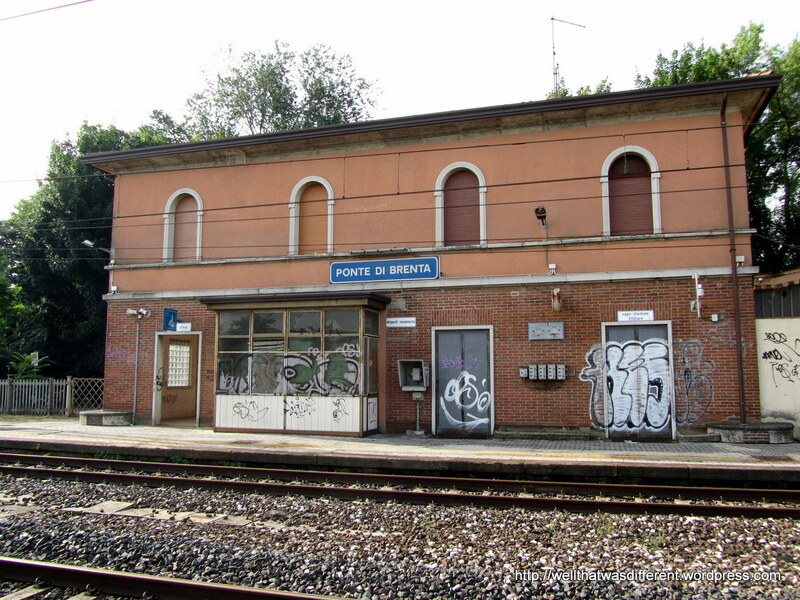 So, the day after checking out Padua, we found the train station that time forgot near our hotel and hopped a regional line into Venice. 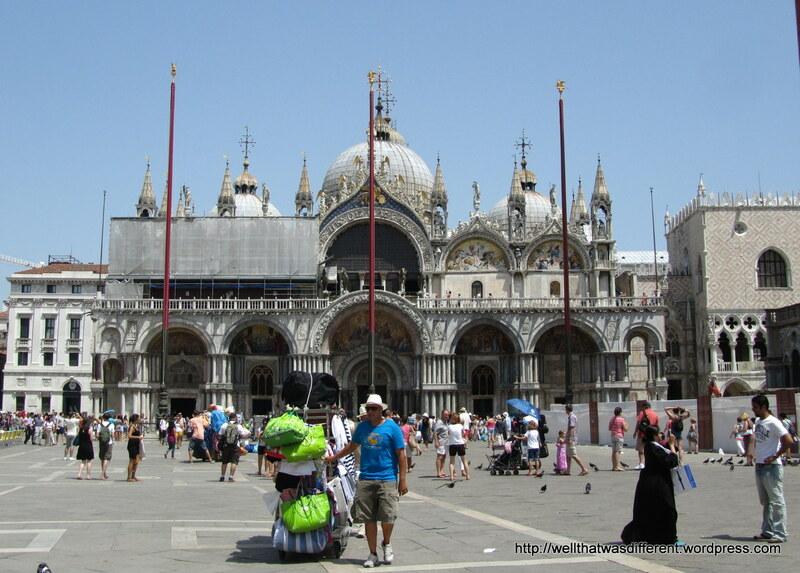 My genius daughter had made online reservations for the Basilica San Marco and Doge’s Palace so we were able to skip the looooong hot line and go right in. Both are definitely on the short list of major tourist attractions that are totally worth seeing. We discovered almost immediately how to avoid feeling like a salmon swimming up a stream of tourists. Just go upstairs. 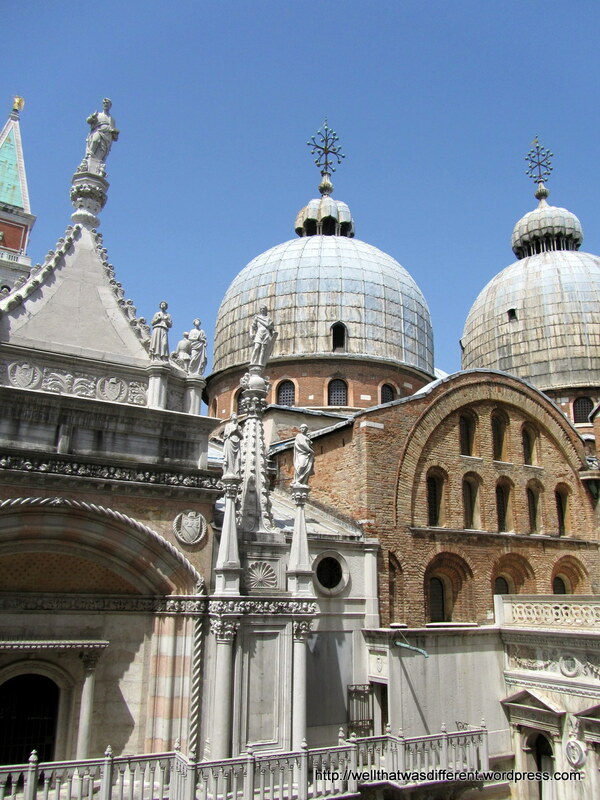 Anywhere in Venice, the population drops by about 90 percent as soon as you simply climb a flight of stairs. 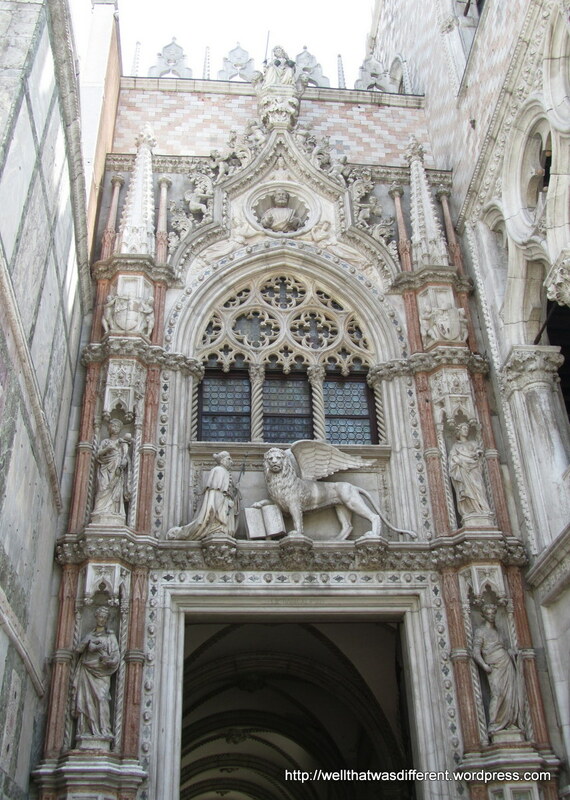 I even overheard one tour guide telling someone that she was sorry, but they couldn’t go up to the museum in San Marco because some members of the group might have trouble going up the stairs. Really, I have seen much steeper stairs in my time, but I guess in that heat, and with the average age and weight of the tour group participants, they do have to be careful. It’s a shame, because some of the neatest stuff is upstairs—on a crowded island with a tendency to flood, you can see why people thought vertically and kept the good stuff well above the waterline! 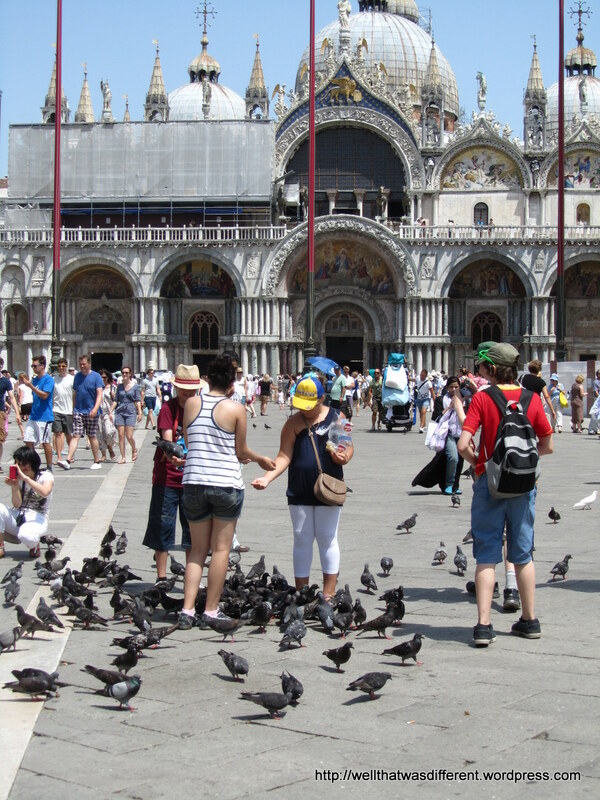 The Piazza San Marco is Ground Zero for tourists, crowded with people waiting in lines, taking pictures of each other, and feeding and fussing over the flying rats pigeons. 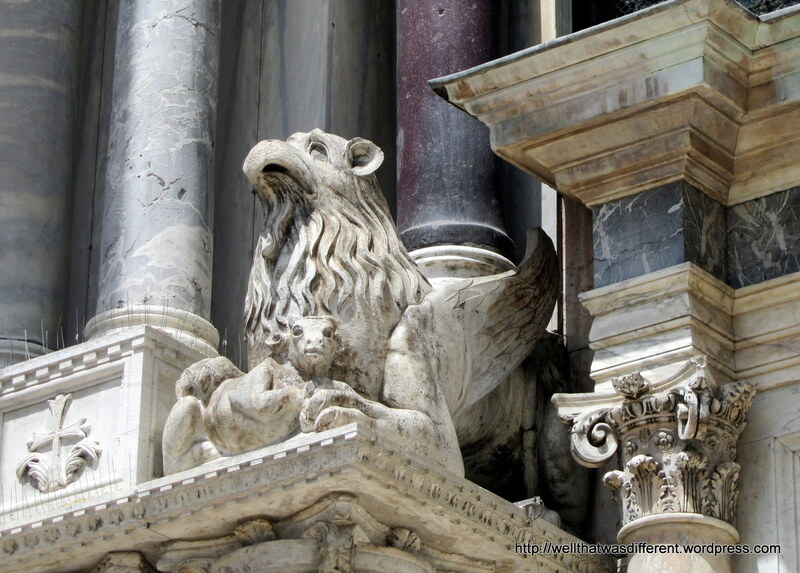 I remember there being a lot more pigeons the last time we went to Venice about ten years ago. It was honestly kind of disgusting. There are far fewer now, because the city government has outlawed feeding them and patrols the square telling people to knock it off. Nevertheless, I saw a bunch of giggly girls feeding the nasty critters and taking pictures of one girl with a pigeon on her head. As I turned away, a collective EWWWW came from the group. The pigeon had pooped on her head. Well, that’s what birds do, isn’t it? After touring the basilica, the upstairs museum, and the terrace, we went to the Doge’s Palace. Once again, almost all the tourists were on the main floor. Go upstairs and it’s easy to get around. 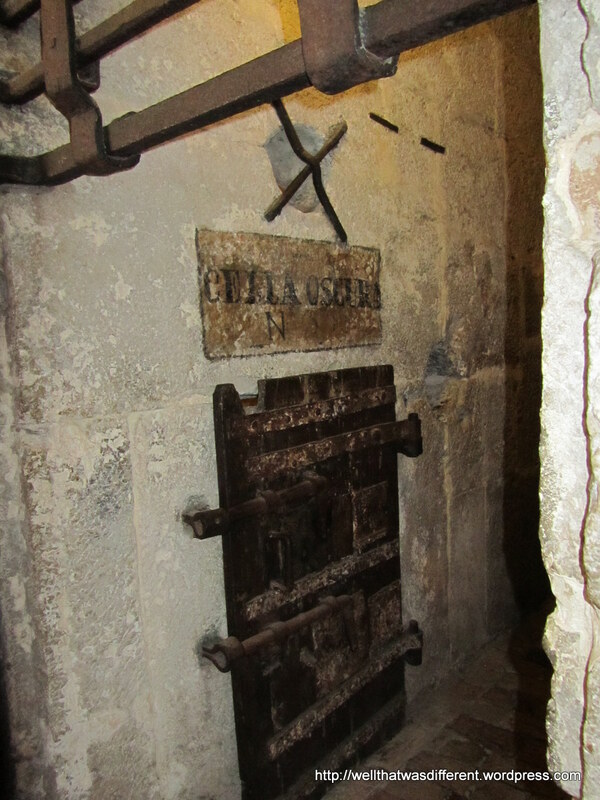 Go downstairs for the “full tour” of the dungeons, and you practically have the place to yourself. It’s spooky! After taking it all in, we ducked down a side street and had a most excellent lunch of seafood risotto, house wine, and one of the better coffees I’ve ever tasted. Even a couple of blocks from the Piazza, the lunch was less expensive than in central Vienna, and the wait staff were remarkably nice. 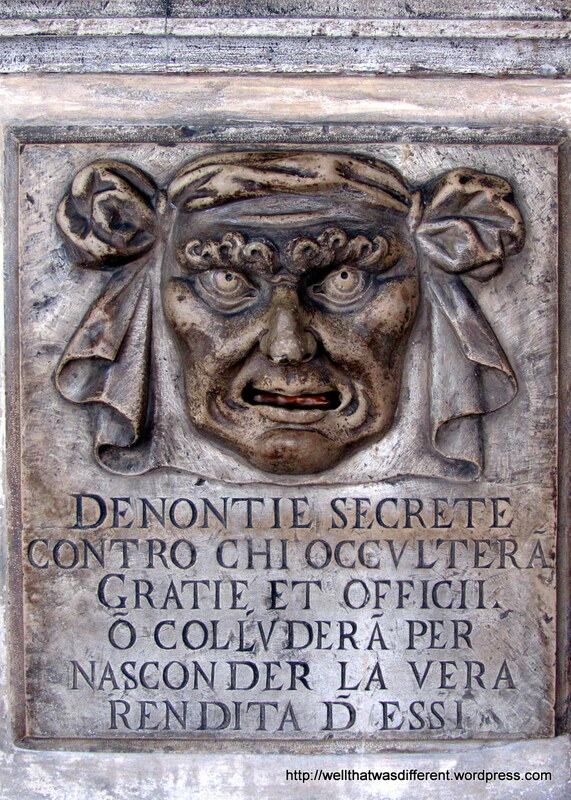 In fact, I was really impressed throughout this trip with how patient and civil the Venetians are. Especially considering that they are completely swamped by tourists. 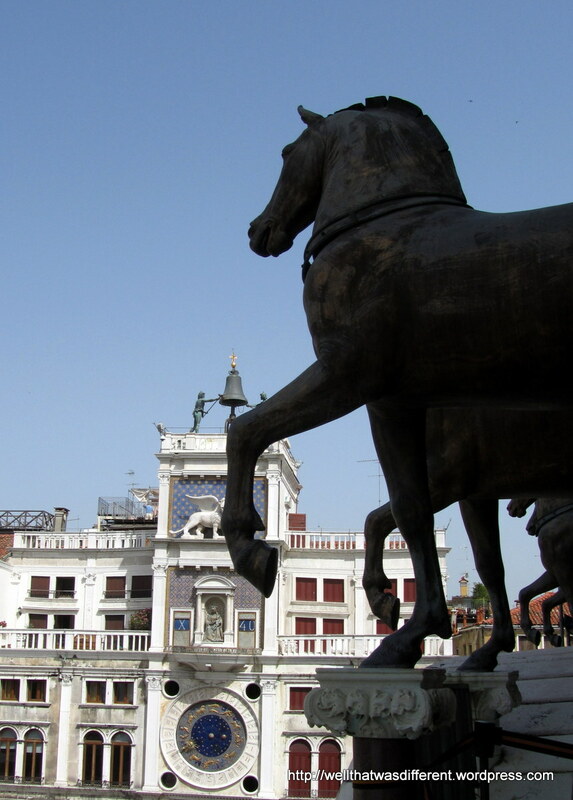 There are only about 60,000 permanent residents of the city, and as many as 18 million visitors every year. Wow. 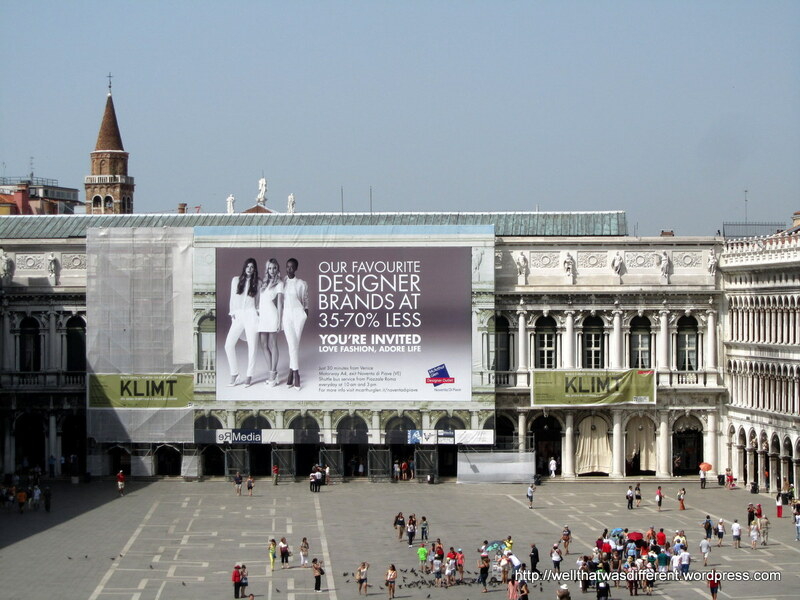 Piazza San Marco, early in the morning before most of the tourist buses arrive. 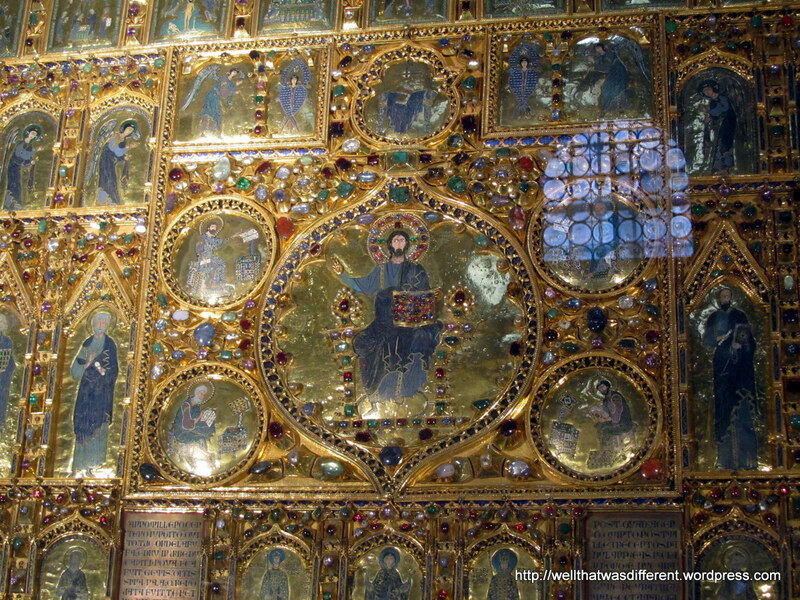 A tiny taste of the bling inside San Marco. 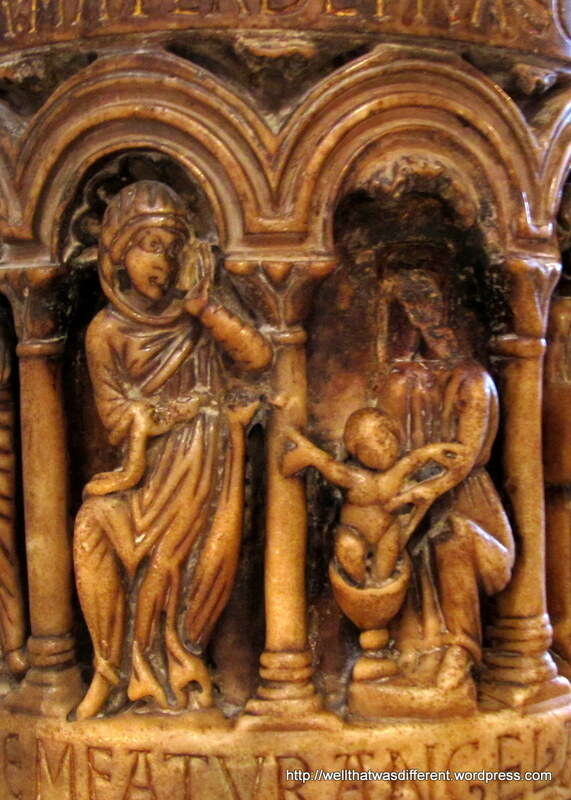 This is the back of an altar. Detail of one of the stone columns supporting the enormous baldachin. 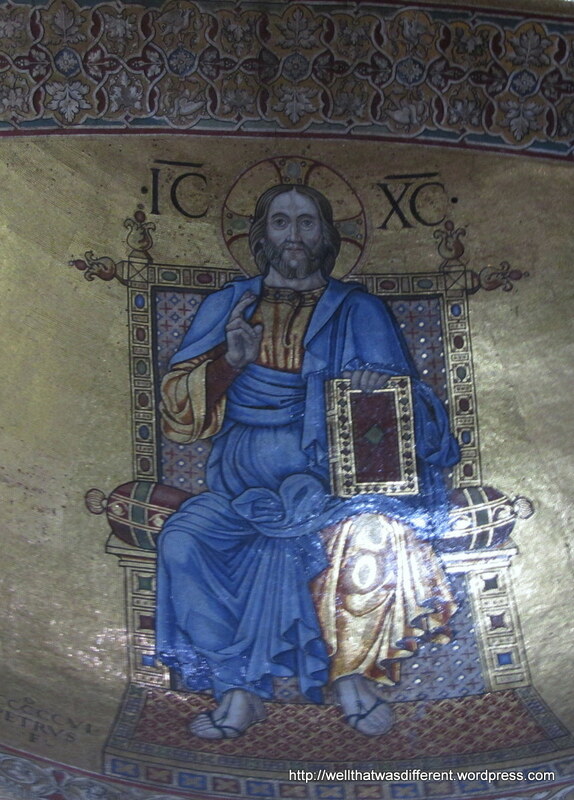 Gorgeous (and really huge) depiction of Jesus on the ceiling of the nave. 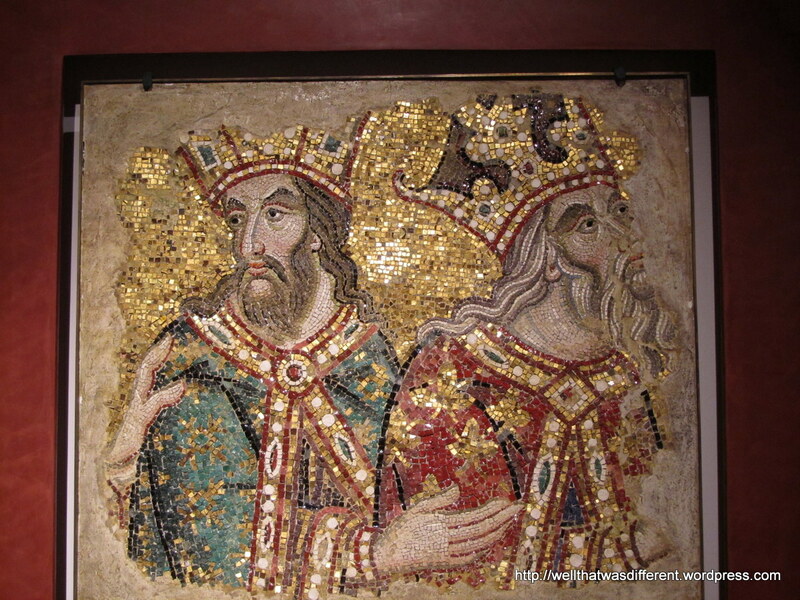 The entire ceiling and most of the walls are covered with mosaics like this one. It’s truly eye-popping. 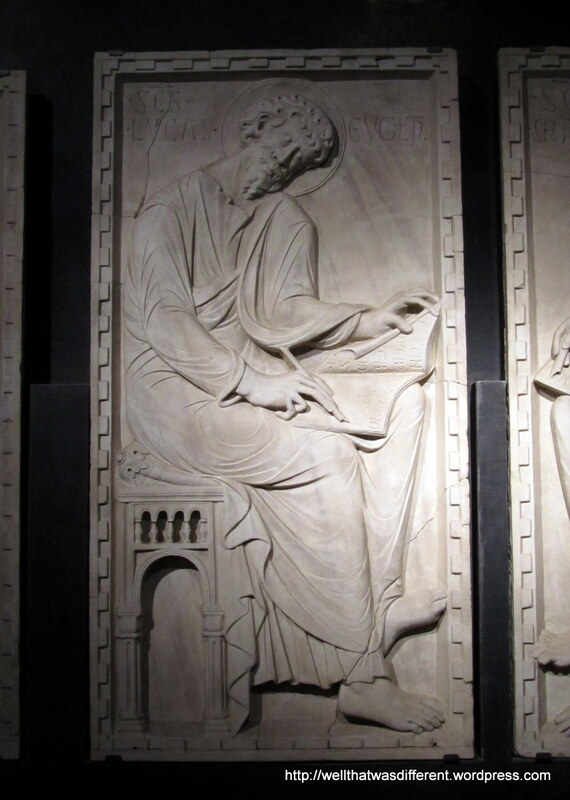 Frieze in the San Marco museum. 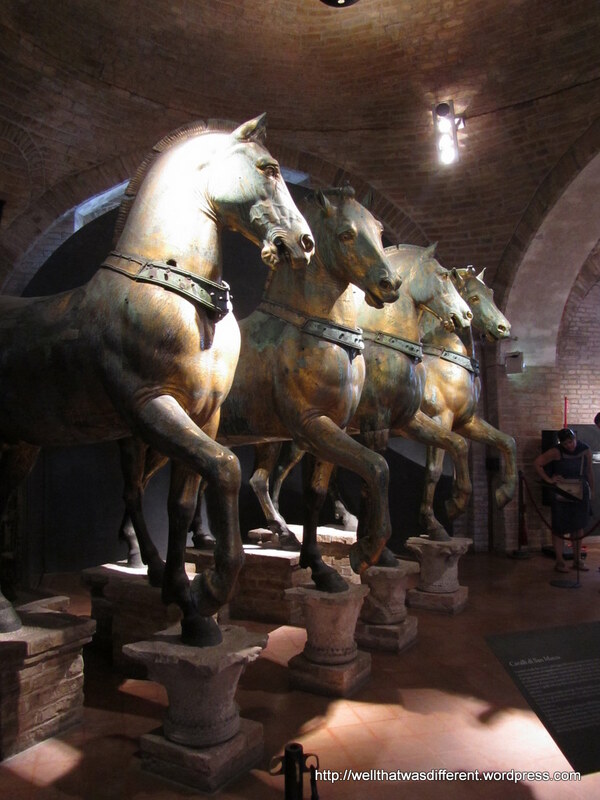 The original bronze horses that were supposed to be on Trajan’s arch in Roman times and were stolen from the Byzantines by the Venetians. Then Napoleon stole them from the Venetians. They are now in the museum for safekeeping with replicas on the outside. 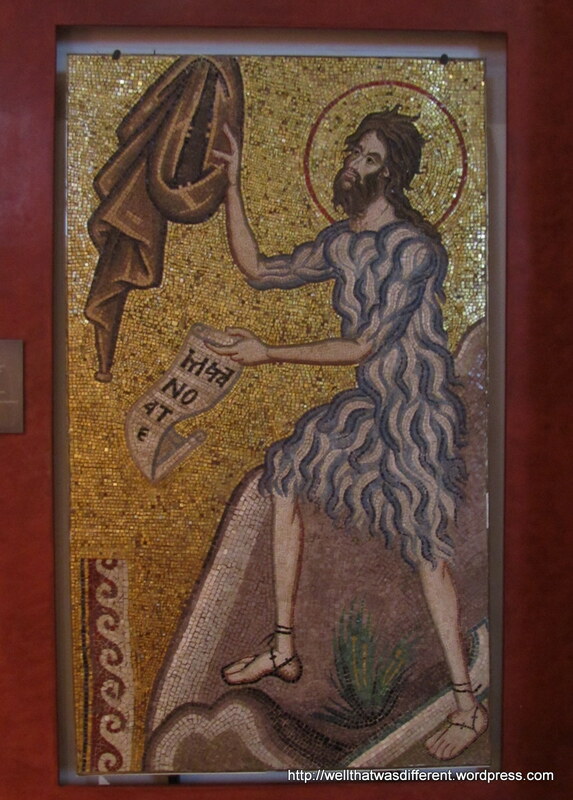 John the Baptist in his hair shirt. 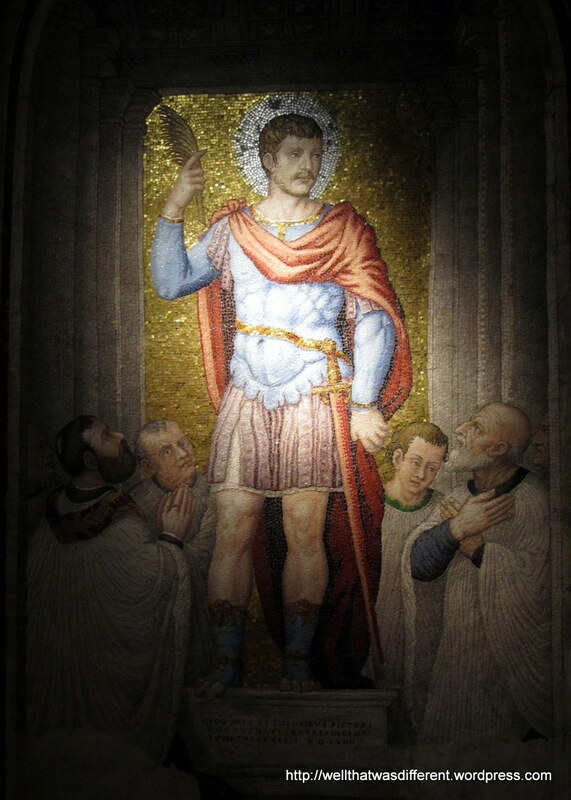 Not sure who this is, but he seems impressed with himself. 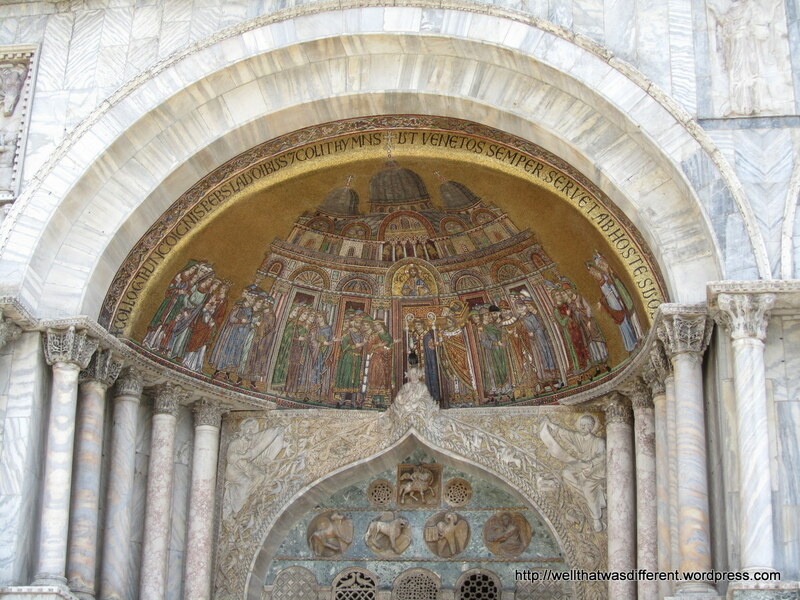 From the terrace above the portico of the Basilica. 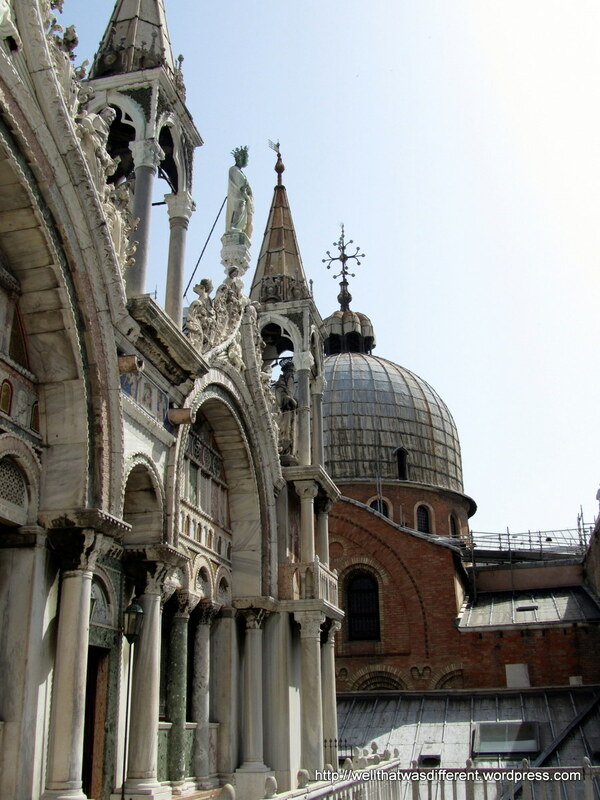 View of the Doge’s Palace from the terrace of San Marco. 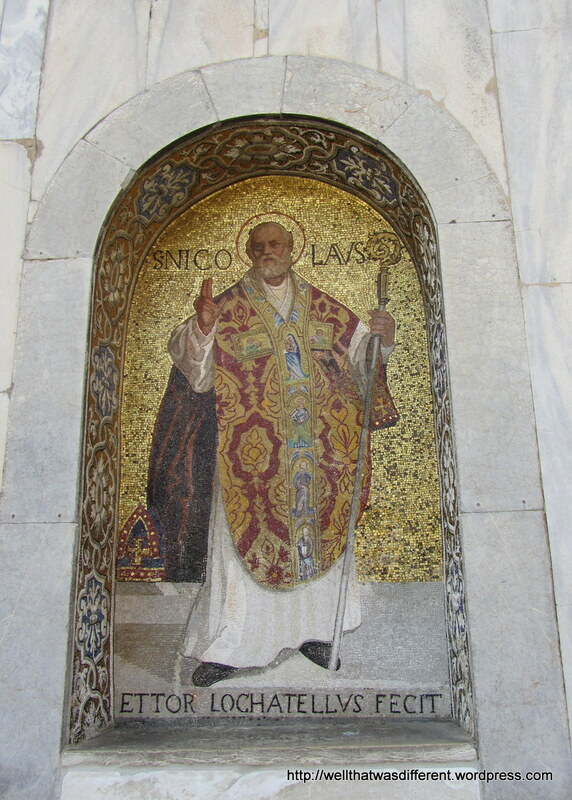 Incredibly detailed mosaic on the terrace, where only the Doge and his guests would ever see it. You can slap an ad on anything in Italy. 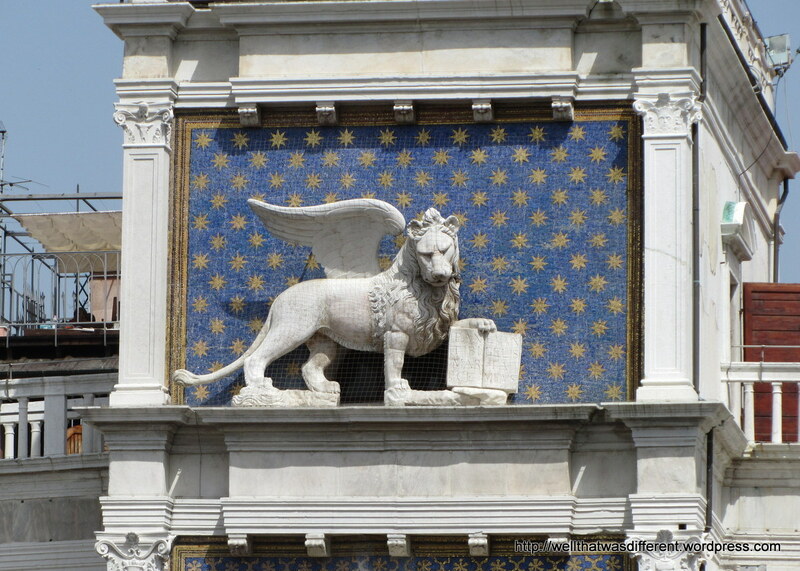 Piazza San Marco. On a building across from the Basilica. 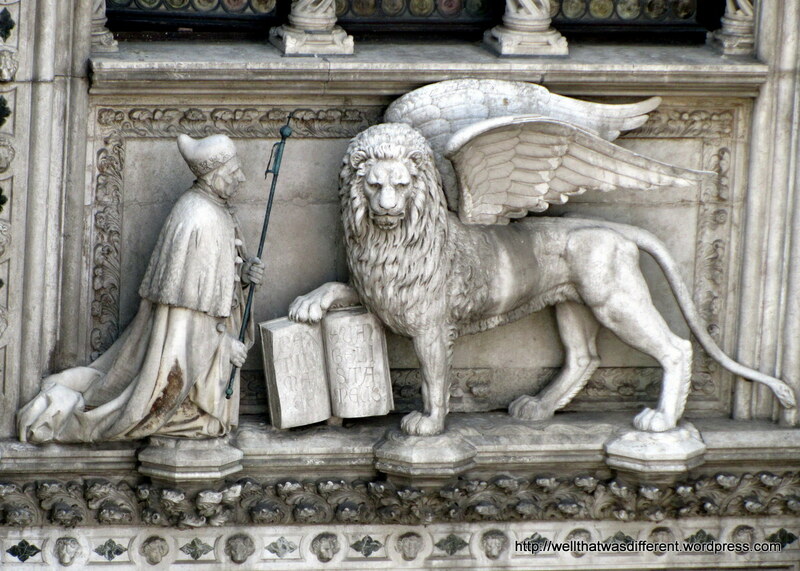 The lion is the symbol of Venice. 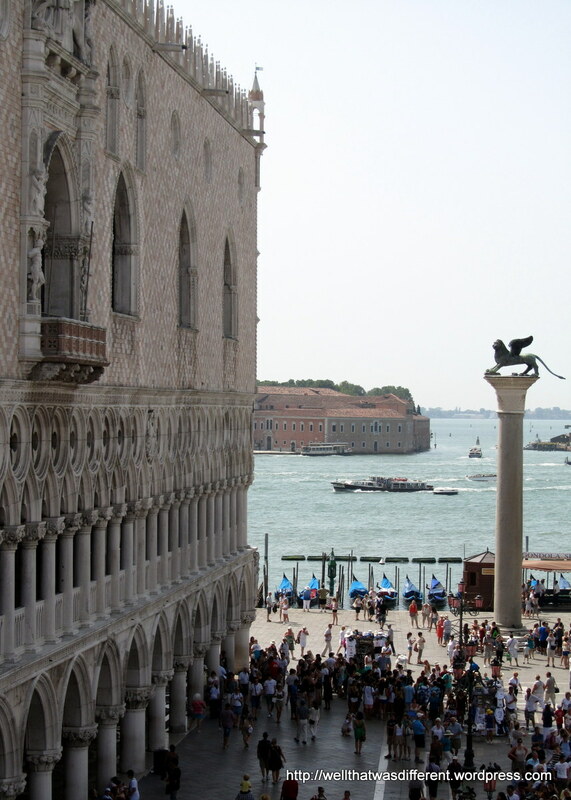 The Doge’s palace and the Grand Canal from the terrace at San Marco. 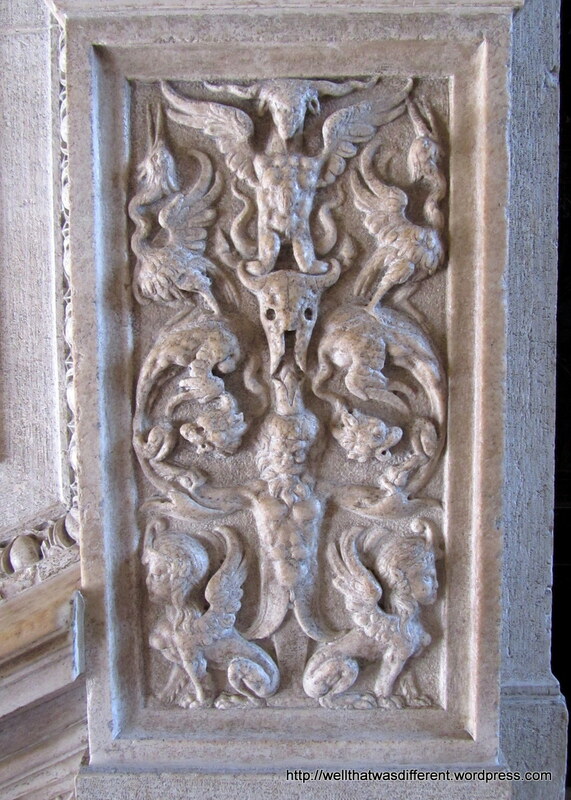 Another detail from the palace. 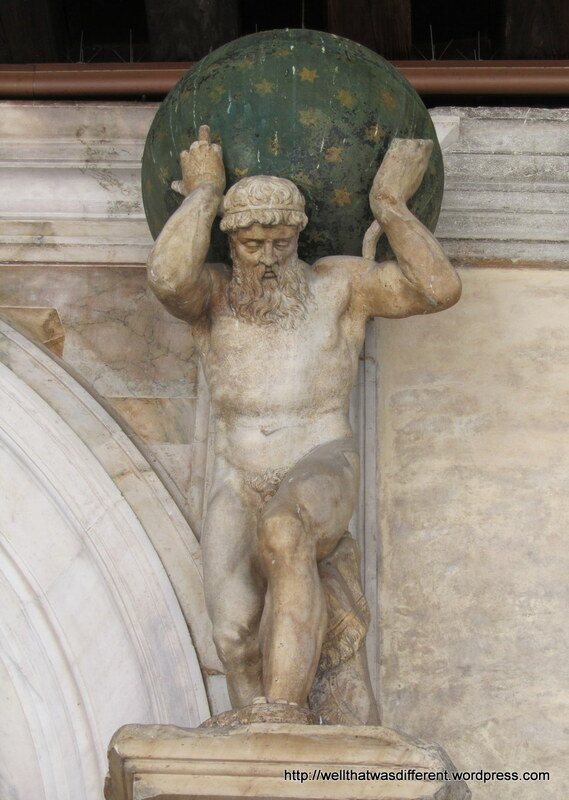 One of two statues on the Giants’ Staircase inside the palace. Detail from inside the palace. Inside the palace. People could rat on their fellow citizens by sticking a note in this statue’s mouth. 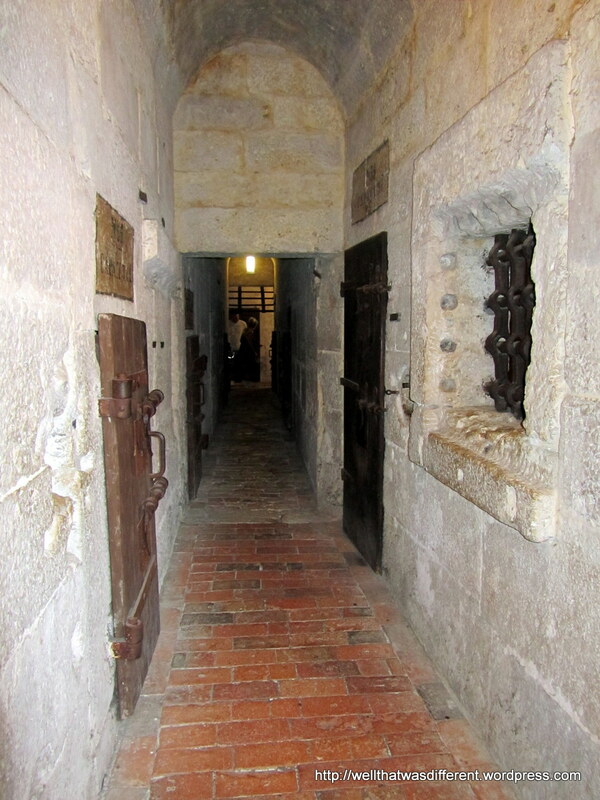 Prison corridors in the basement of the palace. The Doge believed in keeping his enemies close. 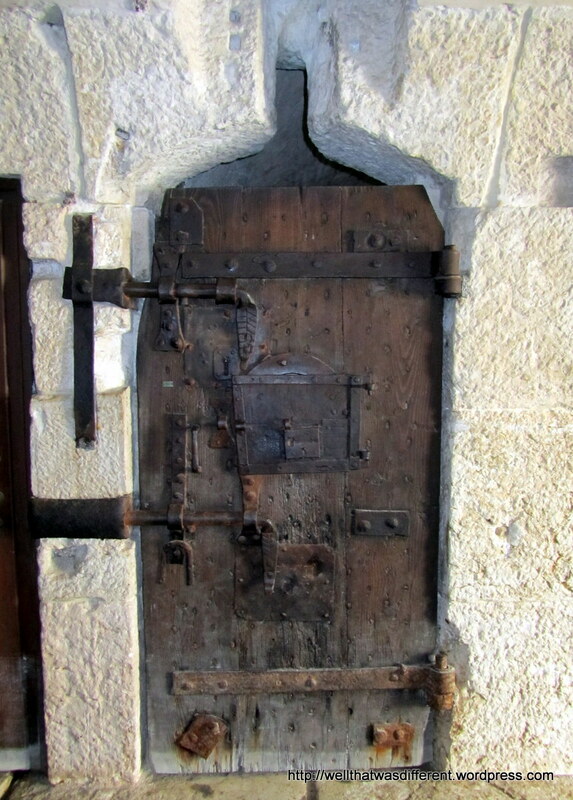 A “dark” cell on the bottom floor for the extra naughty. 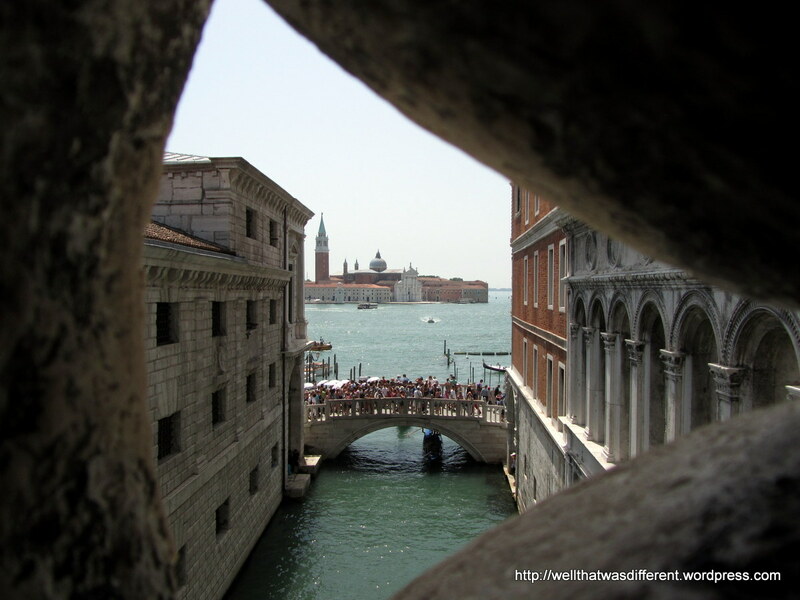 View from the enclosed Bridge of Sighs, traversed by prisoners on their way to the dungeons. Great write up! I love the detail shots. You could spend a lifetime capturing all that. Thanks for sharing.